There’s horror, there’s terror, and then there’s Cart Life. I want to go on record saying I love horror games. 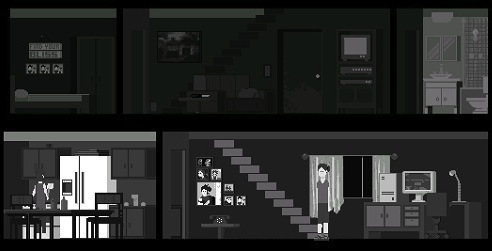 The actual playing of horror games is a process in masochism. The act of screaming in terror while slamming on the pause button becomes emotionally taxing. Then I recoup, catch my breath, and keep on going until it happens again. The feeling when I reach the end, when I finally conquer the horrors and can pin a badge on my chest in spite of my fears, is intoxicating. It’s what keeps me going. It’s not the act of scaring myself that I love; it’s conquering that fear. This desire helped me finish Amnesia. It helped me finish Call of Cthulhu: Dark Corners of the Earth. And it helped me finish all the Penumbra games. I will never beat Cart Life. I would take a thousand water monsters from Amnesia over the dangers faced in Cart Life, because I can conquer the water monster. Cart Life instead presents me with an incontestable truth; when life beats you down good enough, getting back on top can be a sisyphean task. The only thing to conquer in Cart Life is the current day, and there’s always another one waiting. The character select screen provides a wide girth of information. Keep those cigs handy as Andrus. Cart Life is a game where you choose to suffer as Melanie, Andrus or Vinny. All three have reached a low point in their life, and are at a crossroads to recovery. Melannie is recently divorced, and in danger of losing her daughter. Vinny has struggled to keep a job all his life, and Andrus is attempting to start anew in the US as the owner of a newspaper stand. 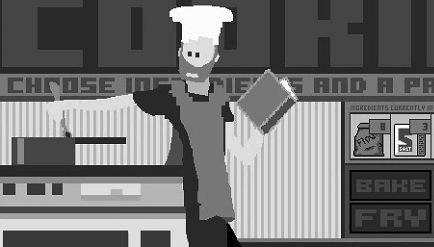 The only thing I`ve ever produced by attempting to cook is something called “crud.” It`s a burnt, formless, inedible blob, and it takes up space in my inventory. Strangely enough, this happens if I try to cook in Cart Life too. All of these people are relying on me to pull them from the brink of disaster, and that is where Cart Life immediately terrifies me to my core. This isn’t like The Sims, where a faceless, gibberish spewing sea-monkey wanders about for my personal entertainment. Cart Life shows you the lives these people live. It presents you with very real responsibilities they need to meet, and people they don’t wish to disappoint. I’ve no desire to torture these people. I see too much of me in them, too much humanity, to do that. Check out Vinny and his monogrammed umbrella. Time never stops in Cart Life; It doesn’t matter if you’ve paused, or you’re in a dialogue box — time is marching onward regardless. As Melanie, part of your daily responsibility is to pick up your daughter from school. So when there’s a long line of customers outside my stand and she gets out of school in ten minutes, believe me when I say I feel a very organic tension I’ve never felt in a game before. It’s the kind of fear I actually feel in my daily life. It isn’t something lurking in the mirror in the corner of my eye. Its not the irrational fear of monsters roaming my hallways when the lights go out. It’s waking up and realizing I never set my alarm for work. and I’m already an hour late. The kind of fear you can’t really conquer until you suffer the consequences in full. And this what horrifies me the most in Cart Life; the cost of failure. When I fell on hard times in my own life, I had people there to act as a safety net and catch me. Family and friends came to my aid, and provided a home or security when I could not provide my own. 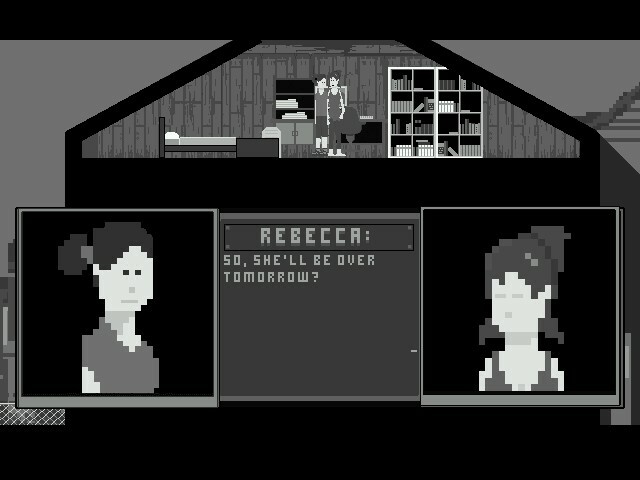 Becca sets up a place for you in the Attic. I seem to have caught her mid blink. The people in Cart Life have no safety net, or in the case of Melanie, are already in it. This is the low point. If I fail, they have nowhere else to go in their lives. Each character has a preset amount of time to meet a financial goal. I’ve only made it within a week of these deadlines before I end up quitting. I can tell I’m not a good enough street vendor to make the prerequisite money, and when the end looms, I cannot bring myself to see the aftermath. The thought of having to watch their lives descend into disaster is too much. I’m unwilling to witness the consequences. It’s the one fear I cannot conquer. So I start again, hoping for a better try. It’s the one thing Vinny, Andrus, and Melanie have over me; a restart button. The least I can do for them is make use of it. Becca cooks dinner every night. It’ll make your life as Melanie a lot easier — and save you from creating a lot of crud. 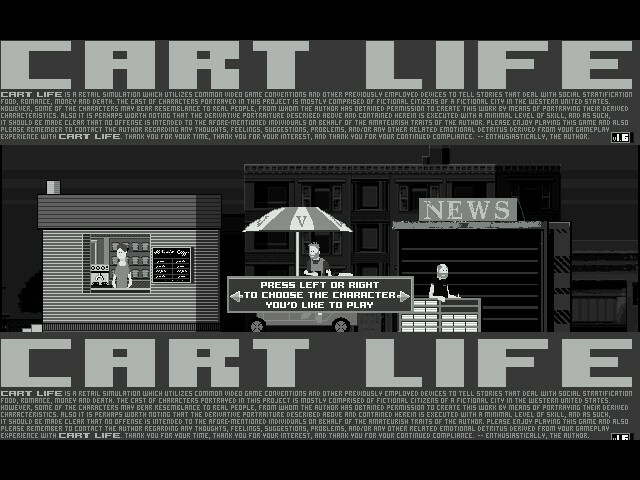 Assuming you aren’t already totally depressed, you can play Cart Life for free here. You can also purchase it on Steam or off the website to play as Vinny.